On my way to work, I felt a bit hungry. Normally, I have some toast or some hot cereal for breakfast, but today, since I left a bit early, I decided to stop at Tanabe's Superette. 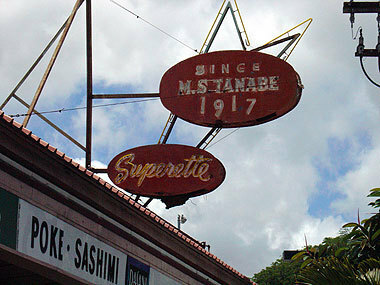 Tanabe's is a neighborhood convenience store, and as the sign states, has been around since 1917! I couldn't tell you if it's been in this location all that time, but I do know that I've been here many times over the years. 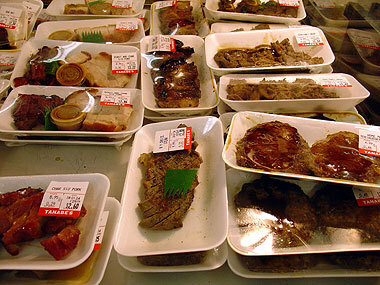 Here along with alcoholic beverages, juices and sodas, you'll find some pre-cooked food already packaged and ready to go. 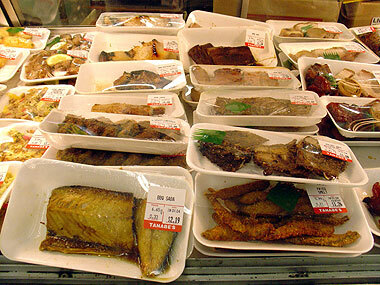 That's a package of saba (mackerel) in front. Here's some char siu (Chinese barbecued pork), roast pork, and tonkatsu (pork cutlet). Some nigiri (hand-pressed), maki (thick rolled), and inari (cone) sushi. 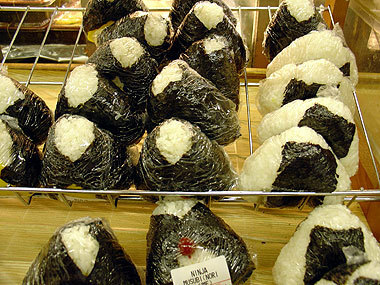 Some musubi or onigiri (rice balls). And for you healthy types, some pre-packaged cut fruits. Here we have some li hing pineapple (pineapple with Chinese preserved plum powder), as well as some "plain" pineapple, cantaloupe and watermelon. 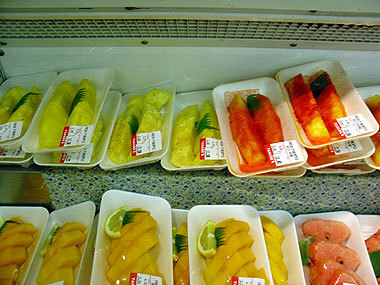 Besides the pre-packaged foods, you can also buy other items like chips and whole fruit. 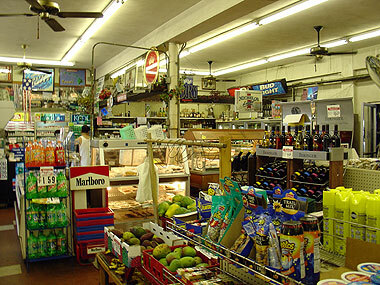 On the right hand side of the store, they also have a hot lunch counter that serves a variety of local foods. This morning, I picked up a couple of musubi called the yokozuna (US$1.10) or was it the akebono....sorry, I'm not too sure. In haste, I ripped off the wrapping to eat them while they were still warm. They had goma shio furikake (seasoned seaweed with sesame seeds and salt) mixed into the rice and an umeboshi (pickled plum) in the center. Warm and delicious, with just the right amount of seasoning, this was a perfect start to my day. I've heard that the store sells upwards of 300 musubi per day, often selling out shortly after lunchtime (or 1:00 pm). They have a wide variety of grab-and-go foods that are perfect as in between meal snacks, or even as a make-shift bento (box lunch). In fact, many items sold here would be perfect to be eaten at a picnic on the beach. Great idea for those of you into last minute get togethers. If you're looking for something more substantial, stop in for a Spam® musubi or one of their breakfast rolls, you won't be disappointed. ooh. what are the breakfast rolls? you don't know how bummed i am that there's only brown rice in the house. no chance of making spam musubi right now. Did I ever mentioned I LOOOOOOOOOOOOOOOOOOOOOOOOOOOOOOVE sushi and nigiri and maki and inari sushi?!!?!?!?! AAAAAAAAAHHHHHHHH! You "kill" me everytime you update your blog!!!! *sigh*!! That's it! I'm having japaneses tonight! 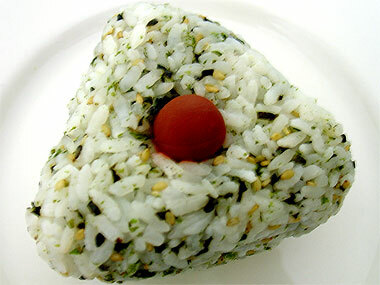 Those onigiri look delicious... I love them grilled warm and drizzled with teriyaki sauce. Mmmm. Wow. Tanabe's. Once upon a time, I used to work at HMSA--practically next door on Keeaumoku St.--and I used to frequent Tanabe's on my coffee breaks! Looks like everything is the same--great onolicious local Japanese food. Mmm! How about profiling the new Palama Market on Kalakaua? It's nearby. Lovely looking musubi. I bet they were scrumptious! Hi Reid, I love musubi! I ate them almost every day for lunch when I lived in Kyoto. Yum yum yum. This here tuna sandwich just doesn't cut it after looking at all of those mouth watering pictures. I sure miss all of those mom-and-pop stores which sold those homemade goodies back in the islands. Kind of reminds me of the old Ruger Market and their famous bentos. 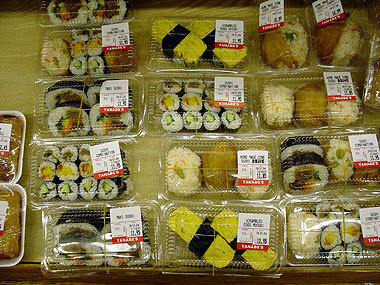 Might have force myself to bring some musubis tomorrow with fried spam or vienna sausages for lunch. Little takuan might be good too but then I'll have to eat all by myself...I guess you know why? The breakfast rolls are good. Actually they are like sushi with breakfast stuffed in the middle. I can't for the life of me remember what's in it...see, now you're going to make me go there again so that I can get rid of this nagging feeling! Hmmmm. I haven't eaten dinner yet and Spam® musubi sounds great! I love Japanese food too. Sushi is one of my favorites even though I don't eat it that often...trying to stay away from all those carbs! Welcome to my blog! I like yaki onigiri too. It's so yummy. I wish I was closer to Tanabe's, then I'd go more often. Well...it's actually not too far from where I live, but it is in the opposite direction of the office. If I get up early enough, I have lots of time to get there. I was actually going to go to the new Palama Market a couple of days ago, but decided not to. I was hungry and just stopped at Daiei. I'm planning on going there this weekend. If I can find anything interesting (like kim chee) I'll be blogging about it! Long time no hear! Yeah, it's too bad that you can't come "home" for the holidays. I wish that I could have gone to SF for the holidays. It would have been a nice change for me. The musubi here are great. I think there are like 10 different kinds (maybe more). Musubi are nice. I especially love them when they are warm. I could eat these every day, but truthfully speaking, I can't. Don't want to look like a sumo wrestler from eating all those carbs. Musubi with Spam® (or vienna sausage) and takuan sounds great. I used to enjoy stuff like that years ago when I used to live in the states. People thought I was crazy to eat so much rice...especially for lunch. I'm planning on making a stop at Fort Ruger Market soon (maybe this weekend). I'll write about it for sure (love the boiled peanuts in the paper bag)! Haven't stopped in there for a while but may again because of your review. The reason for stopping to shop there was that the help the store hired then, assuming the help were the ones preparing the food, altered the whole fundamental characteristics of the food items...like in the case of one lau lau I bought there, had plenty of taro leaves inside which is good, but then no pork at all...never had that happen anywhere. I think i would be the only one in love with my store. .if i open one here in yarmouth.. hehehe!! the ppl here... ain't really fancy in trying new things.. so sad.. ! I am headed over to Oahu this sat. My wife grew up in Kailua, but now we are stuck in Alaska during a horrible winter. Can't wait to try some of the places you feature. I love the site and check you out everyday. Have you ever tried Little Village in Chinatown? I think that it is really good and plan to head there for my first meal back home. The store is quite old, but the folks there are helpful. The food is reasonably priced and quite tasty. I'm sure you'd like it. Thanks for dropping by the blog. I normally don't have the hot food at the counter on the side preferring to purchase the pre-packaged items. I like to buy those because it's "what you see is what you get". 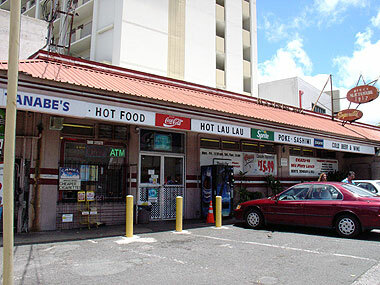 I don't normally buy lau lau from just anywhere, so I'm not able to confirm what you've experienced. Hope to hear from you again! Hope you enjoy your visit to Hawaii and get out of that nasty weather. Thanks for your comments about the site. I hope you'll continue to visit.